Recommendations: The War of Art - Steven Pressfield - discusses the challenges of avoiding distractions and fighting the battle to stay creative. This is a must read for any musician or artists of any kind. North Seller - Dulk - this is a painting by one of my favorite pop surrealists. He has many many paintings of equal quality so I simply picked one of my favorites. He just so happens to be making the art for dirtybird this year. I have tried to hire all my favorite surrealists over the last 7 years to work on dirtybird. 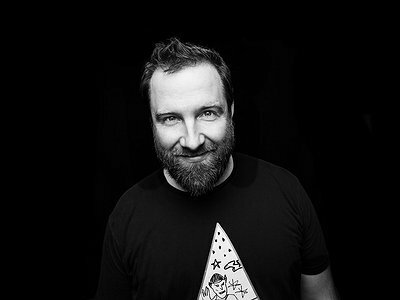 Website / Contact: If you enjoyed this interview with Claude VonStroke, visit his facebook profile or the website of Dirtybird Records for current tour dates, background information and music. When did you start with your own label - and what or who were your early passions and influences? What what is about music and/orsound that drew you to it? I started Dirtybird in 2004 and our first record came out January 2005. All my passions in the electronic realm were based in hip-hop and drum n bass until I moved to Oakland in 2000 and met some guys that really liked house music. Since the house music parties were where I could find all the girls at the time I ended up getting into house, but I still wasn’t in love with it yet. For most artists, originality is first preceded by a phase of learning and, often, emulating others. What was this like for you? How would you describe your own development as a label curator and the transition towards your own approach? What is the the relationship between copying, learning and your own creativity? I had been making electronic music for 15 years before I released my first record on Dirtybird. I even made beats at 11 years old. But I did not go to a lot of parties until I moved to the Bay Area. One thing that made it work on Dirtybird and why I never succeeded before was that I learned how to edit everything down to one single concept. I learned how to remove everything that wasn’t needed by going out to the club 3 and 4 times a week and listening to the records that really worked. This is how I got a much better perspective on how to do it. At home you have no perspective of the dance floor. You have to either DJ or go out all the time to understand club records. Once I figured out that I only had to have a great groove and a single idea, everything became so much easier for me and the success was almost instant because I had so much experience already in production. It's kind of like the difference between being book smart and street smart. I was already book smart but I had to learn the streets to get good. I didn’t know ANYTHING. So royalty accounting, vinyl production, distribution and all the admin stuff were an absolute nightmare. I also did all the artwork and all the scheduling and contracts and everything by myself for many years. It was extremely difficult but I was so dedicated I didn’t even care. Now, the challenges are much easier, things like how are we going to clear a sample or if the artwork is late. Nothing is ever as hard as the beginning and now I have so much help, my team is awesome. That's actually one huge lesson that took me way too long to learn. Just hire a great team and spend the money. It will pay for itself. When you do everything alone, you cannot do the things you want to do and you cannot grow. I don’t hand hold but I am very supportive of our artists. I will send notes on music only if I think it can be fixed, otherwise I don’t bother. I see us as a platform with a giant fan base; it is up to the artist to take advantage of it. Dirtybird provides the launch pad and maybe even the rocket, but the artist has to actually do some work or the engine will not fire up. I always encourage artists to take more chances and get super weird. You would be surprised that almost no one takes that advice even though it's the best advice I can offer. Try to separate yourself. What are the most important conclusions you've drawn from the changes in the music-, music-PR- and music-journalism landscape? How do they affect labels in general and your own take on running a label in particular? What role do social media play for you rapproach? Data collection and well planned marketing are a big part of our success. In general - we make profit but only because we are way ahead of the curve. We have our own subscription service, our own clothing line our own festival and our own events series - so “label” is all relative. For me personally, social media started out kind of fun and now its just a place where everyone is jockeying and paying for this and that to try and get “big.” Even so, we use social media to display the facts and try to tell the truth. I think we are already in the age where the fans know the difference between fake marketing and real sentiment. On the release side, music streaming is everything. (I should have listened to my old manager about that one.) But one of the most frustrating things is being a DJ and trying to find uncompressed music files of everything you want to DJ. The streaming has actually removed the part of the market for DJs who need real files. Machines excel at processing massive amounts of information. Humans excel and connecting to other humans. If you combine them correctly, you can be unstoppable. Sometimes I am better at interfacing with my machines than I am interacting with humans. This is something everyone is balancing. Even my kids who want to play video games all day need to play basketball and read books or they will become lopsided. I fight the same battle but my video games are synthesizers and DAWs. I never really collaborated until last year when all the sudden I decided that I was lopsided and ego-centric and that I could actually learn from other musicians. Fear held me back, but after a few tries I saw that everyone has fear and everyone is scared to meet new people and say what they feel. I made an entire hip-hop focused album using live musicians, rappers and co-producers. It was so enlightening I decided to bring the same way of working over to my house music friends. I just needed some confidence. I think the death of most collaborations is a lack of confidence by one of the sides. "At home you have no perspective of the dance floor. You have to either DJ or go out all the time to understand club records."